It would seem, as of recent, that there are things happening in my life that make me stop and say, “Ah, this is what it feels like to be an adult.” It’s usually silly things like not being able to eat those two bowls of ice cream (I try, so hard) or the realization that the cheap coach we have isn’t as comfortable as we once thought (I went to Crate and Barrel the other day, sat on one couch, and realized I’d been missing out). We’ve had some pretty major (adult) life rumblings happening in our house that I’ll hopefully be able to share soon (all good, just a bit chaotic) but in the meantime, with the fall temperatures finally hitting Northern California: I made cookies. In the bowl of a stand mixer fitted with the paddle attachment or in a large mixing bowl with a hand mixer, beat together the butter with both sugars until blended and fluffy. Add the eggs, vanilla extract, baking powder, salt, and baking soda, and continue to beat until everything is well incorporated, scraping down the sides of the bowl as needed. Add the flour and mix on low speed until the dough comes together and everything is well incorporated. Stop the mixer and scrape down the side of the bowl again if necessary. Stir in the chocolate chunks. Scoop the cookies onto baking sheets using an ice cream scoop or spoon, using 2 to 3 tablespoons of dough. Flatten slightly with the palm of your hand and bake for 12 minutes, or until the edges are lightly brown; the centers will not be set but will continue to set as they cool. Let cool for 10 minutes on the baking sheet and then transfer to a wire rack to cool completely. Store in an airtight container at room temperature for 3 to 4 days. 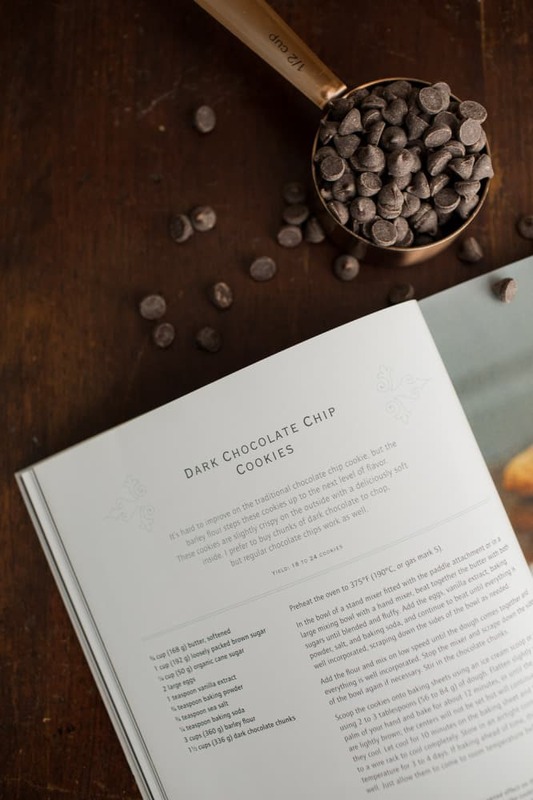 *The original recipe calls for chopped dark chocolate, which is also delicious. You could also try add a handful of chopped nuts such as pecans or walnuts. *Types of baking sheets may change the bake time of the cookies. 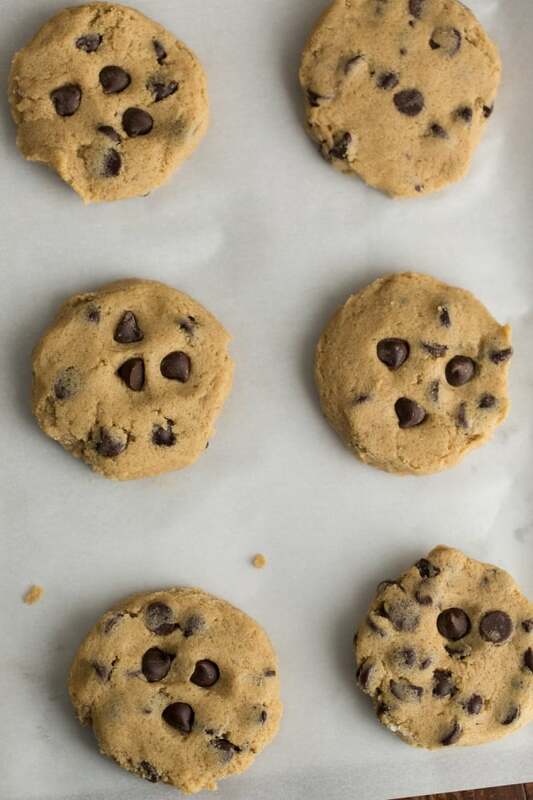 If using a darker baking sheet, watch cookies closely at around 100 minutes. If using a silicone baking mate, like a Silpat, cookies may need longer to bake, more towards 15 minutes. Recipe originally from The Homemade Flour Cookbook. these cookies look like the onesy mom would make as a kid. Oh these look to good for words. The napkin is lovely what a awesome way to fund her schooling! Thanks for sharing! Greetings! Those look like lovely cookies and lovely napkins, too! And so nice together. I love your ideas for using a variety of flours! I can never get my cookies to look as perfect as these. Beautiful! Tasty-looking cookies and lovely napkins, what else does one need? It’s funny how adulthood just sneaks up on you isn’t it?! 😉 Beautiful napkins! I’m getting a wheat grinder for Christmas, so this is right up my alley! Absolutely love your site and recipes. These ones look as yummy as the others!! Hi there! These cookies look lovely 🙂 as do the linens! Hi! 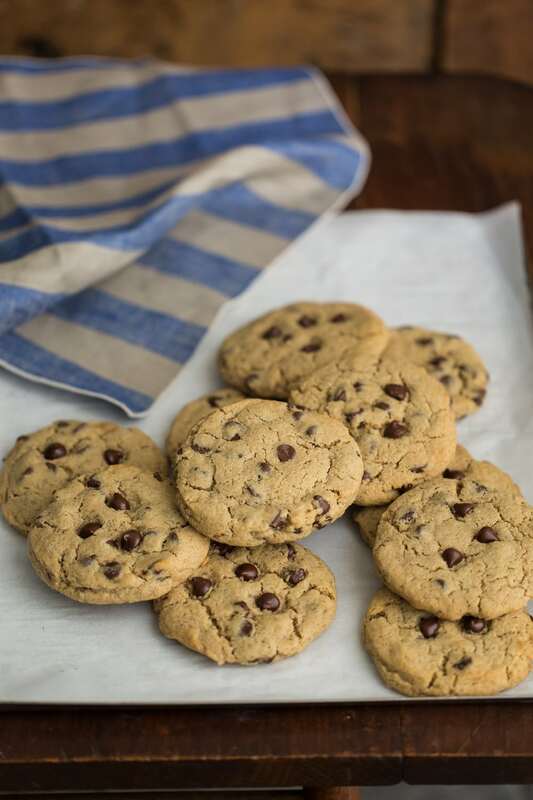 These cookies look beautiful and delicious… I love classic chocolate chip cookies and using barley flour is so inventive! I’ve seen her linens before and would LOVE to win them… gorgeous! Thank you for the healthier dessert recipes! I’m always looking for substitutes for white flour. Barley flour?! Sounds really interesting. And cookies look just fantastic! My first visit to your page. You are an easy-to-read writer, like you’re talking with me. I like that. And I totally understand what you mean. You look back at your old self through your current belongings or positions in life and it can be puzzling…”Did I really like this when we bought it?” “Did I even look at others, or do research?” or the most heartbreaking one I’ve had recently “How did I ride the Tower of Terror and the Aerosmith roller coaster, literally, all day long and LOVE it. I can barely ride them once now.” I will be back to read more! I wonder if cookies will cure this heartburn? Howdy from Michigan. Looks amazing Erin! I need to get my hands on that book! I’d be tempted to throw in some nuts with the chocolate chips, but other than that, these look perfect! I’m a sucker for soft cookies. You know, I’ve recently tried baking with alternative flours and I have not been having any luck. I don’t know if it’s the recipes I have been following or my palette – but working with coconut flour is just so drying. I really need to purchase your book so I have a better understanding and more recipes to use! I’ve been looking at it forever…maybe on payday! Cookies look delicious! Made your recipe teriyaki chickpea baked potatoes for dinner last night (again) and had a happy family! Thank you! I don’t eat refined sugar anymore, but these look delicious! 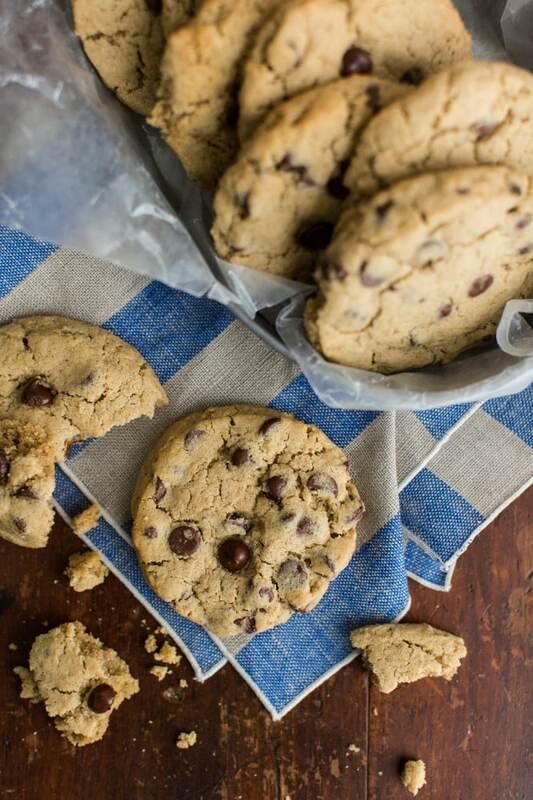 These cookies sound amazing — classic yet subtly different — and those napkins are beautiful too. Thanks for the giveaway opportunity! Hi! I love rye flour, I will have to give barley flour a try next! Looks delish! I love baking with different flours. The flavor are incredible! Happy Sunday Erin, I know what you mean about your couch. We placed foam and batting under the cushions for more support, but it didn’t quite cut it. You don’t realize how uncomfortable you are until you sit on something solid. so luckily a friend of ours is re-doing it for us. I have you to thank for introducing me to Einkorn, what a difference it makes in baked good. Thank you. I live in London so that rules me out of the competition, but still wanted to say YUM to the cookies and BEAUTIFUL to the napkins. These look delicious. 🙂 I love your book- thank you for all your ideas and inspiration! Hi Erin, Funny, when I first saw your email, I read ‘Barely Chocolate Chip Cookies’!!! And I thought, now how is Erin making a barely Chocolate Chip cookie and why, just why would she! HAH But just before deleting, I saw my mistake! Lucky me! Weekend fogs are for everyone! i haven’t ever seen barley flour in the store but i’m sure going to be looking for it so i can make these cookies. Cheers!! Hope you had a great weekend! These cookies sound lovely! The napkins are gorgeous too and even if I don’t win these, I’ve bookmarked them and will be purchasing them in my future. Hi Erin. The cookies look delicious. I have never used barley flour before and I am looking forward to trying it. The napkins are lovely, also. I love your website and your stories and pictures as well as the recipes, of course. Your post got me thinking… I recently received a bag of Romano beam flour. If you had it in your possession, what would you do with it? I am looking for ideas so it doesn’t languish in my pantry. Also, I love the napkins. Hello from my daughter Olivia to yours. I recently discovered your blog and I love it! I have found so many new recipes that I want to try! 🙂 I really like the napkins! Hi chocolate chip cookies!…I mean Hi Erin! Hi Erin! I’ve been planning to try this recipe since I bought your book, but I keep forgetting to get the barley flakes. Let’s see if I manage to bake the cookies this week. These cookies look delicious! Thank you for sharing! 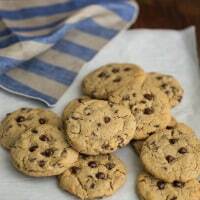 Nothing better than a homemade chocolate chip cookie. Best served to those who can appreciate a crisp cookie or a soft cookie…as long as good ingredients are involved they will be pleased! Hi! Lovely linens and yummy-looking cookies!! These look awesome (the cookies and the linens)! These cookies look so good! Also those napkins are lovely. Erin, We love this!!!!! here is the direct link to the linens https://www.etsy.com/listing/207889132/set-of-4-beige-blue-stripe-linen-dinner? Hello! I love the idea of getting whole grains getting snuck into my favorite treats! Looking forward to grinding and using a variety of grains. Always want to know more about how to use what I have. Yum! I’m really intrigued by the barley in these cookies! looks delicious! Hello. Oooh, cookies wrapped in lovely linen looks like a perfect autumn treat. I am so excited for baking season. Lovely looking cookies, and I am definitely intrigued by the use of barley flour. Do you think buckwheat flour would also work here? Thanks! WOW these cookies look amazing! I really need to buy a food processor so I can start trying all of your recipes that involve interesting flour. I wonder if I can buy barley flour at a specialty store though? Probably not… I might try this recipe with another wheat flour–assuming it won’t change the texture too much. Hi Erin, I am new to your blog but absolutely passionate about whole grain baking. Yours is inspiring. These look like the best chocolate chip cookies of life! there are few, few times you can go wrong with dark chocolate. this is not one of those times. 🙂 look delish!!! I just experimented with barley flour for the first time this weekend! Will have to try these next! Just made these and wow! Super yumms!